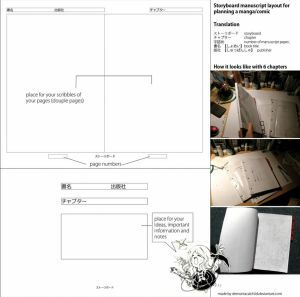 Tutorials related to Manga and Anime. Example: Anime eyes,, Anime styles, Manga comics. A common theme in manga and anime is the school setting. Often the school uniforms are what the character wears all of the time (even when half way across the world, looking at you Jotaro). School uniforms often take a similar style, but variations can be a key design aspect of the character. This is Part 1 in this series, Girls uniforms. Female school uniforms typically take the form of a blouse and skirt, with socks or leggings. They can wear jumpers, vests, or a blazer in the colder months. Variations on this general theme can take a number of different approaches. You have a great story, a bunch of characters and you want to create a manga. However, where do you start? Do you have it Left->Right or Right->Left? How should you publish it (*note: some publishers may have additional requirements/restrictions)? The process is pretty much the same for any graphic progression such as comics. Luckily, there are a great number of tutorials to help you on your way. A storyboard is a panel or series of panels which detail the sequence of significant events in a planned scene, i.e. a rough sketch coupled with some words to describe the actions in the scene. At this point you'd need to have an idea of whether you are making a left->right or right->left manga and your story has been separated into scenes and plot points you wish to use to drive your story. Artist's Toolbox: Creating your own manga! Before we start, I think it's important to keep in mind that drawing manga pages is a very demanding task that requires a lot of time but also, a lot of knowledge in many aspects of illustration such as general drawing, perspectives, anatomy... but it also requires writing skills, for you will need to come up with an interesting plot, dialogue, narrative and more things that will guarantee that your storytelling will go hand in hand with the art in each page. This might seem complicated, but don't fret It is a very fun and rewarding experience that no one should miss! Give it your best shot! Write down your ideas! Polish the plot, analyze the time-space continuum, make sure the idea is exciting and doesn't have plot-holes. Do you want to submit all your pages as ONE FILE to download? Please create first a ZIP folder. There is a button called "Choose a file to upload", click on it and choose the Manga ZIP folder and click OK.
Datafile will take a while to load. Paneling is a part of Graphic design. O_- It's an art in itself, think of how you would do a collage and put together a puzzle, that's how paneling works. As for paneling.... there is no set way to do it, whether drawing the picture first, or draw the panel's first, or draw the panels and the pictures back and forth.... it's all upto the artist, as long as the result is satisfying to the artist. Just experiement and find the best way that suits you.